If you’ve been reading this blog for a while than you already know that coffee is a major food group in our home. During the heart of the farm season we’re up before dawn and having a cup of extra strong coffee to help jumpstart our day is critical. I’m also finding that coffee has been playing an important role in my mornings recently because it’s been so gloomy at the farm and sitting inside with a mug of freshly brewed beans is extremely comforting. 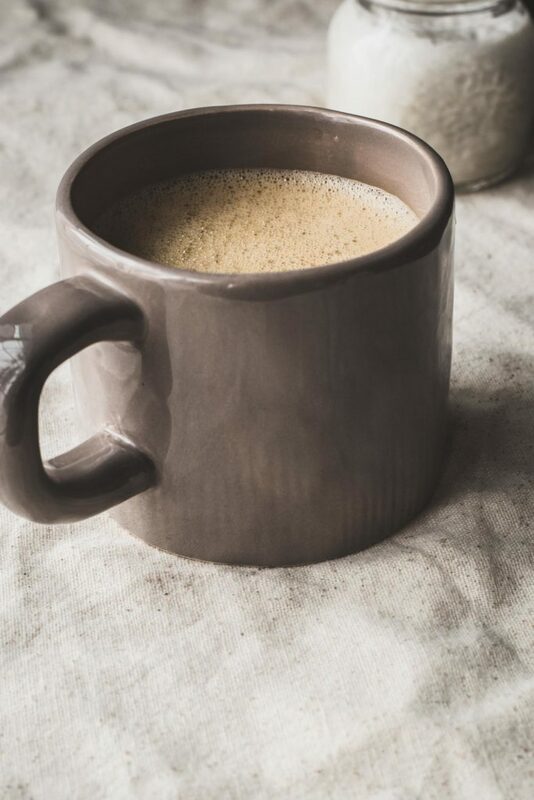 Taylor and I have been jazzing up our morning brews with this incredibly delicious vanilla coconut coffee creamer from one of my favorite bloggers– Laura Wright of The First Mess. This recipe is from her debut cookbook The First Mess Cookbook (her’s debuted exactly one week before mine!) If you love what you see on DUTD then you will be blown away by Laura’s book. It’s absolutely gorgeous and full of over 100 plant based recipes for every season. I could not be more proud of you Laura–she’s a beauty of a book! If you struggle to get out of bed in the morning I think this vanilla coconut coffee creamer will help jazz up your morning! If your dates are very soft proceed to the next step. If your dates are a little on the dry side, place them in a small bowl and cover them with boiler water for 5-10 minutes. Drain. In a blender, combine the dates coconut milk, vanilla, sunflower oil, and sea salt. Blend on high until you have a smooth and thick liquid with minimal chunks of visible dates. Over a medium bowl, strain the mixture with a fine-mesh strainer. Store the creamer in a jar with a tight-fitting lid for one week. Do you store it in the fridge or at room temp? I can’t wait to try this! I’ve been looking for a dairy free creamer recipe to whip up at home and this sounds delicious. My creamer came out pretty solid. Is that supposed to happen? nope. It should be pourable. Your can of coconut milk may have been the issue here. Id add a little water or almond milk to thin it out a bit. Hi there, I just wanted to know if this coffee creamer separates out or does it stay mixed? It depends on the can of coconut milk you use but just give it a good shake before using. finally got a chance to make this, I’ve been meaning to for months!! Will definitely be sharing this around to my friends, such a smooth and creamy texture without any of the funky stuff I see at the store!